America’s Battalion is taking over Northern Marjah. Second, Battalion, 8th Marines, out of Camp Lejeune, N.C., has replaced Lejeune’s 2nd Battalion, 9th Marines, in Afghanistan, Marine officials said. Marines with 2/9 were preparing to return home as of Jan. 30, according to this Marine Corps news release. The deployment wasn’t easy for 2/9, but it yielded a variety of progress. 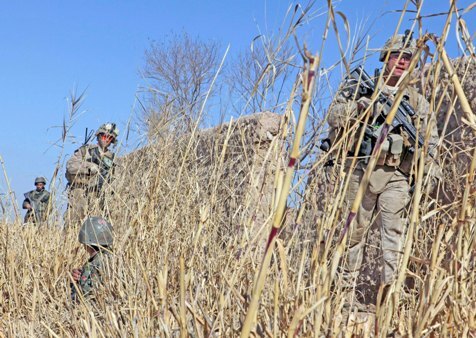 The battalion deployed to the same volatile area of operations that Marine Corps Times joined 3rd Battalion, 6th Marines, in last May, and suffered a total of 15 casualties. Marine commanders now tout Marjah as a success story, however. The area was considered peaceful enough that Echo Company 2/9 was pulled away to volatile Sangin in December, spending six weeks fighting insurgents alongside 3rd Battalion, 5th Marines, out of Camp Pendleton, Calif., in one of the most violent parts of Afghanistan. Three 2/9 Marines died in Sangin within days of arriving there. Marines in 2/8 are no strangers to Afghanistan, either. The unit deployed to Helmand province in 2009, pressing insurgent forces in a deployment that lasted from May to November. It also participated in Operation Khanjar, a massive operation in which more than 4,000 Marines took over land along the Helmand River in July 2009. My son LCPL Marc Casimiro is deployed with the 2/8 in the Sangin Valley. We are very proud of him and pray for his safe return. My stepson is also with the 2/8 in Sangin Valley. I also have a son in the 3/9 in Marjah right now. I am so proud of them and all our Marines! They are all in my prayers daily! My son is a Corpsman with E 2/8 and it is great to hear some news. I’m very proud of my son and all of 2/8. You are all in our prayers. You are our Heros. God Speed to all my brothers…Stay safe! I pray for you guys everyday. Semper Fi brothers. My son Lcpl. Dan Dworkin is also with 2/8 Echo in Sangin. We are beyond proud of him and pray for his safety and 2/8s safe return. You got this boys!!! Love you Danny!! Miss you tons already…..
My hero and son, LCPL. Bryan Conlon is with 2/8 Echo Co. in Sangin. My thoughts and prayers are with him and all of our military in Afghanistan. 2/8. I miss my brothers I was in Marjah for only a week before I got hit. I miss you guys, prayin for yall everyday. See yall in september. My brother LCPL Justin Lavin is with 2/8 Echo Co. So very proud of him and miss him tonnns. Cannot wait for him to come home. Praying for them every day. My son, CPL Ryan Skibenes is in 2/8 WPNS CO. I am very proud of him and have gotten to know many of his bretheren. They are a great bunch: determined and extremely capable. Praying for their safe return…You’re my hero Ryan! My son is there too, and we all pray for them to do their job well ! Remember OPSEC, names dates places ! My Husband Sgt. Veniskey is with 2/8 Echo Co. and I am so proud of him and the Marines he is with. My 2 boys miss there daddy so much and as a family we are praying for his safe return, along with the rest of 2/8. My nephew Joe Pendergast is a corpsman with 2/8 Echo company. Praying every day. My son, LCPL. Bryan Conlon is with 2/8 Echo Co. in Sangin. My thoughts and prayers are with him and all of our military in Afghanistan. My God watch over all of you. You all are hero’s. I miss you son dearly! My “brother” Eric Shaw is there with 2/8 and I miss him! My prayers are with him and his brothers-in-arms! Take care gentlemen and return safely home to your loved ones. My son Thomas is a Corpsman with the 2/8. I am as proud of him as a mother can be. Always in my thoughts and prayers that everyone returns home safe and sound. Buddy you are my hero!! My son,L.Cpl Andrew Lopez is with E,3rd squad/platn ‘SAVAGE”. I wish him and ALL of 2/8 a safe return in a few weeks. My son Phillip Strobel is with the 2/8 E Company 2nd PLT. We are proud of you and your company. We pray for your safe return. The 2/8 is in God’s hands. I miss you son. My son is Sgt Seth Lamoreaux with 2/8 Echo WPNS and I have had the pleasure of meeting with some of these men. I also read some of their conversations with their bothers back here. Bless them all, but I wouldn’t want to be a tali head and run into these men. Hurry home men, you’ve done your duty. Time to party…..dam proud….come to ohio and visit anytime. YEAH! Our boys are comin home!! I never thought this day would come but it has. I am so proud of each and every Marine and Sailor with the 2/8. Especially my son Thomas L Burns Navy Corpsman. Can’t wait to see your smiling face again! Thank u everyone for ur prayers and concerns. and to all u men and wemon who gave up your sons to fight along side of me in afgan…. i am with Wpns Co. Map 2. and it was a long and hard road but we made it through and had one of the most successful deployments afghan has seen in a while….. and i know Skibs he is an awsome leader and mentor… agian thank you for your support. A pal’s son John Lutz From 2/8 echo took his life in Davie Fla this weekend .. God’s speed & RIP john..
What are the odds? My son LCpl Brian Conlon (note different spelling of first name) was stationed at FOB Shamsher in Sangin last year, now safely home. I pray for the safety of all our Marines.